If my last meal on this earth was brunch, then I’d die a happy woman. Brunch is the oh-so-delightful combination of breakfast and lunch. 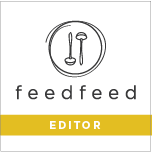 Eggs, savory meats, sweet pastries, coffee and maybe a little tipple. Anything that one really wants to eat is acceptable for brunch. For anyone with a sweet tooth, it’s also the time to experience one of my absolute favorite foods: Viennoiserie. These are sweet yeast-leavened baked goods. The name derives from the French and means “of Vienna” or “Viennese things” due to it’s origin in Vienna, Austria. These types of doughs are enriched with generous amounts of butter, milk, eggs and sugar making them the tenderest of baked doughs. Often times they are laminated (folded over on themselves multiple times) creating flaky results such a croissant. Croissants and brioche are the cornerstone of French viennoiserie. Brioche is gloriously enriched with copious amounts of butter and eggs. It’s not always laminated, like with croissants, making it simpler and quicker to produce. However, laminated brioche dough is a thing of beauty and definitely worth experiencing in one’s lifetime. Brioche is amazing simply sliced and well-toasted with a slather of jam or dunked into your morning poached eggs (my favorite). It makes for the best French toast ever and it’s sturdy enough to be filled or rolled with any fruits and nuts imaginable. One of the best brioche experiences is the brioche breakfast pastry. 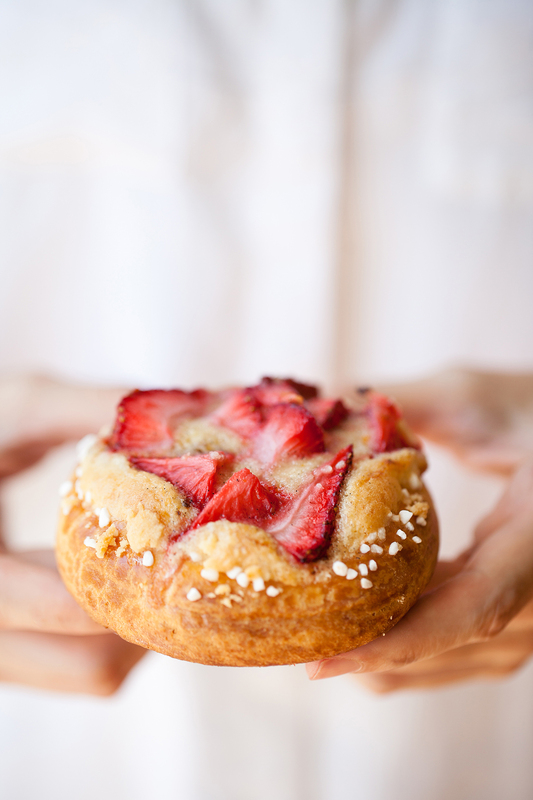 These Strawberries & Cream Brioche breakfast pastries are tender and fluffy sweet. 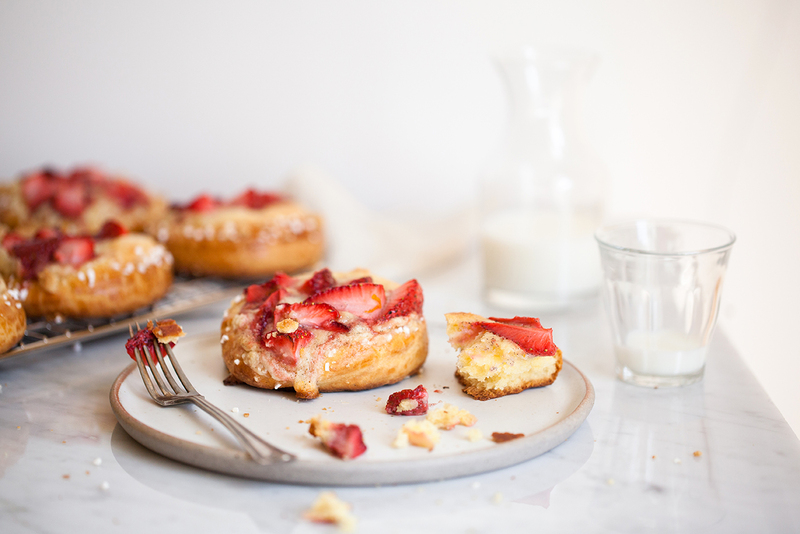 Each round of dough has been filled with a luxurious almond-orange cream, topped with spring strawberries and sprinkled with Swedish pearl sugar. Brioche is a notoriously soft and sticky dough. All that enriched dough makes for a tender crumb, but also makes it difficult to handle. The solution to this is to allow the dough to rest in the refrigerator to chill overnight. This will firm up the dough making it easier to work with and roll out. Please don’t try and work with this brioche until it has chilled (there will be tears otherwise). The last ingredient that’s added to the dough will be the butter. Be sure to add it in gradually, allowing each addition to mix in before the next is added. The dough needs time to absorb the butter. Patience is all that’s required. The last important tip is to scrape down the sides and bottom of the bowl regularly. This will help along the mixing process and creates a uniform dough more quickly. It needs some attention, but it’s a very simple process. If you’d really like to take these pastries over-the-top, the addition of a streusel or crumble would make for a special addition. This almond-oat crumble recipe would be a delicious topping. When complete, your kitchen will burst with the scent of almond, vanilla and strawberries. The brunch table will be set with these brioche beauties. Enjoy! In a stand mixer bowl, whisk together the bread flour, yeast, sugar and salt. Attach the dough hook and add in warm milk (not hot) and eggs. Mix on low speed until combined and dough forms, about 3-4 minutes. Stop the mixer and scrape down the sides and bottom of the mixing bowl. On low speed, gradually add in the butter in medium-sized pieces. Allow each addition to mix in completely before adding in more. Stop the mixer and scrape down the sides and bottom of the bowl regularly to help the mixing along. Tip: Fold the scraped sides in towards the center to be mixed by the dough hook. All the butter should be added to the dough within 2-3 minutes of mixing. Once all the butter is added, mix the dough for a final 5 minutes. Dough will be shaggy, sticky and uniform (no butter streaks). Using a bowl scraper or spatula, transfer the dough to a clean bowl and cover with plastic wrap. Set on counter top to ferment, at room temperature, for 1 hour. Transfer fermented dough to the refrigerator to chill overnight, at least 12 hours. Combine the almond flour, all-purpose flour, sea salt, vanilla bean seeds and orange zest in a small bowl. In the bowl of a stand mixer, with the paddle attachment, mix the butter for a few seconds until creamy. Add the powdered sugar and mix until light and fluffy, on medium speed, about 2 minutes. Add in the dry flour mixture and mix until combined. Mix in the extract and egg until cream is light and fluffy. Transfer almond-orange cream to an airtight container and store in the refrigerator. When ready to use, vigorously stir the chilled cream to loosen it up and soften until spreadable. Store leftover cream in the refrigerator for up to one week or in the freezer for up to one month. 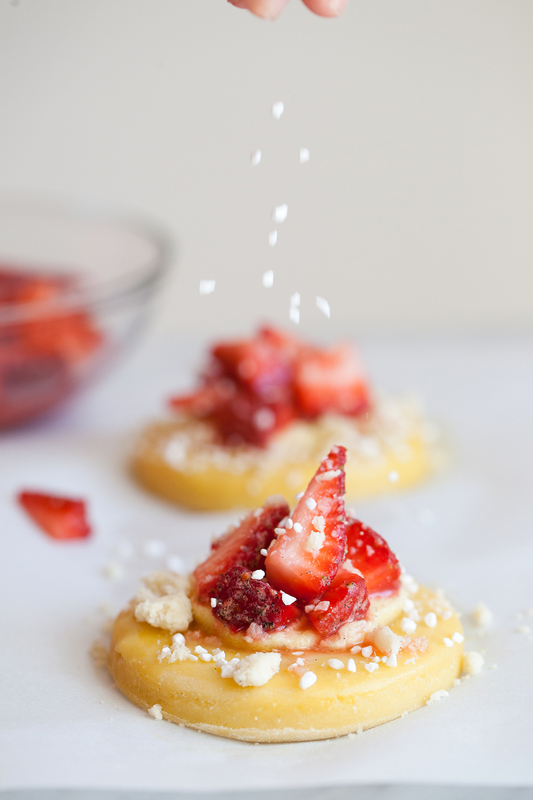 In a small bowl, mix together the strawberries and melted butter until berries are evenly coated. Add in sugar, salt and vanilla. Mix until evenly coated and combined. Set aside until ready to use. After the overnight rest, pull the brioche dough out of the refrigerator. On a lightly floured surface, roll out the dough to 1/4-inch thickness. Using a 3 1/4-inch round biscuit or cookie cutter, cut out individual rounds of dough. Gently press together remaining brioche dough scraps into a uniform dough, roll back out and cut out more rounds. Repeat the process until there are 12 rounds. Evenly arrange the brioche dough rounds onto the lined baking sheets, placing about two-inches apart. Lightly cover baking sheets with plastic wrap. Allow dough to proof, at room temperature, for 1 hour and 30 minutes. Meanwhile, prepare the almond-orange cream. Preheat the oven to 375F, 20-30 minutes before the brioche is finished proofing. To assemble the pastries: Begin by preparing the vanilla bean strawberry mixture. Using a pastry brush, apply the egg wash by gently brushing the entire surface of each brioche round with the lightly beaten egg. Dollop a generous spoonful of almond-orange cream onto the center of each brioche round. * Leave a 1/2-inch border exposed on each round. 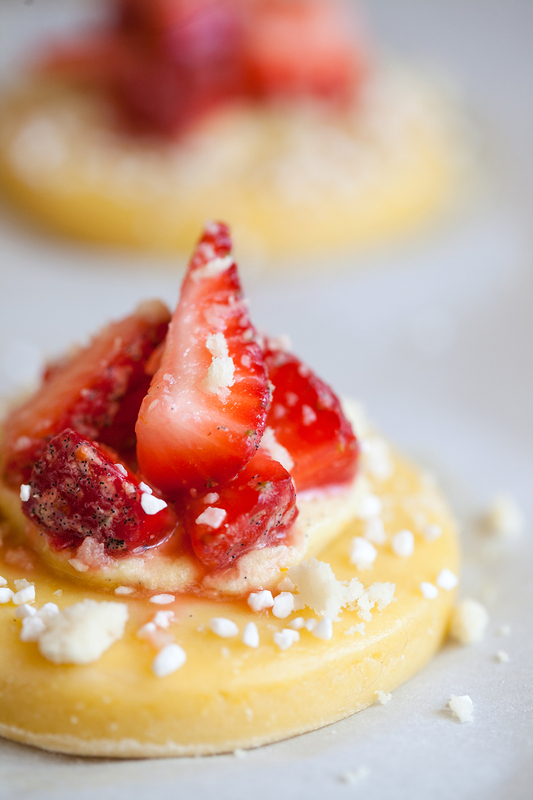 Add a generous spoonful of strawberries to rest on top of the cream. Pile the strawberries high as they will spread out while baking. Sprinkle the pearl sugar around the edges of each brioche round. 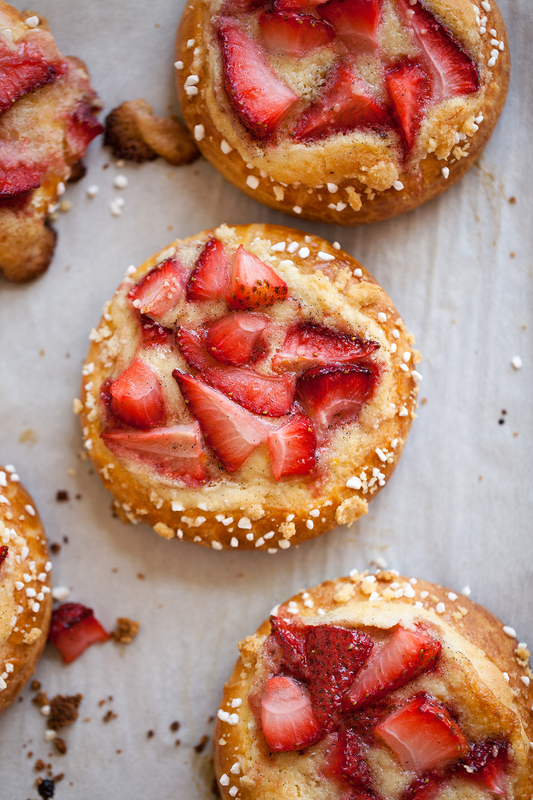 Bake strawberries & cream brioche pastries for 25 – 28 minutes, until deeply golden. Remove from oven and set on cooling rack. Pastries are best enjoyed the day they are made, but may be stored in an airtight container for up to two days. *Tip: Another way to apply almond-orange cream onto brioche is to prepare a pastry bag with a medium-sized round tip. Fill the bag with cream and pipe a round of cream onto the center of each brioche dough. the almond and orange cream sounds so tasty; and love that it sounds like it’d be gently flavored, so that the strawberries can shine!